Among more than a dozen castles to be found in County Dublin, one stands out for having remained in the hands of one resilient family—the Talbots—for nearly 800 years. Malahide Castle, located nine miles north of central Dublin and about seven miles from Dublin airport, has evolved over the centuries, from a functional stone enclosure complete with moat, drawbridge, portcullis, church and central keep, to the imposing but elegant, multi-towered castle you can visit today, with its sprawling lawns and orchards. There are various meanings of the name ‘Castle Malahide’ but it likely comes from the Irish Caisleán Mhullach Íde, meaning castle on the hill of ‘Ide’—a feminine name that likely refers to the Norman family that lived there prior to the English invasion. The Talbot family descends from William ‘Talebot’ of Normandy. William’s grandson Richard is believed to have served at the Battle of Hastings in 1066 when William the Conqueror first seized the English crown. As a reward, William granted to Richard valuable estates in England. In 1174 a later descendent—also named Richard—accompanied King Henry II into Ireland to assert his rule and to tame the aggressive Strongbow (Richard de Clare). The grateful king then bestowed upon Richard Talbot the lands and harbor of Malahide. 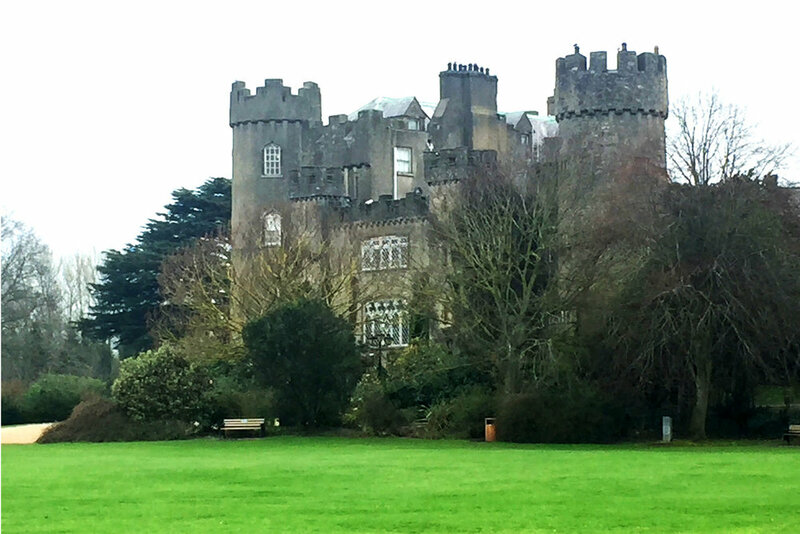 This castle is not featured in any of my novels (so far…), however Malahide is famous for surviving through tumultuous and violent centuries, and provides a fascinating glimpse into life in an ancient fortress, and the enduring spirit of the family that lived there. The oldest part of the castle dates from the 12th century. It was enlarged in the mid-15th century, and the cylindrical towers were an 18th century addition. On approach, the castle is quite beautiful, set in a vast green field with the ivy-covered towers, sunlight glinting off the their peaks. While the castle’s ground floor is now designed for group gatherings and exhibition, the real show begins upstairs in the Oak Room. Here the dark oak panels on the walls are intricately carved with Bible scenes. 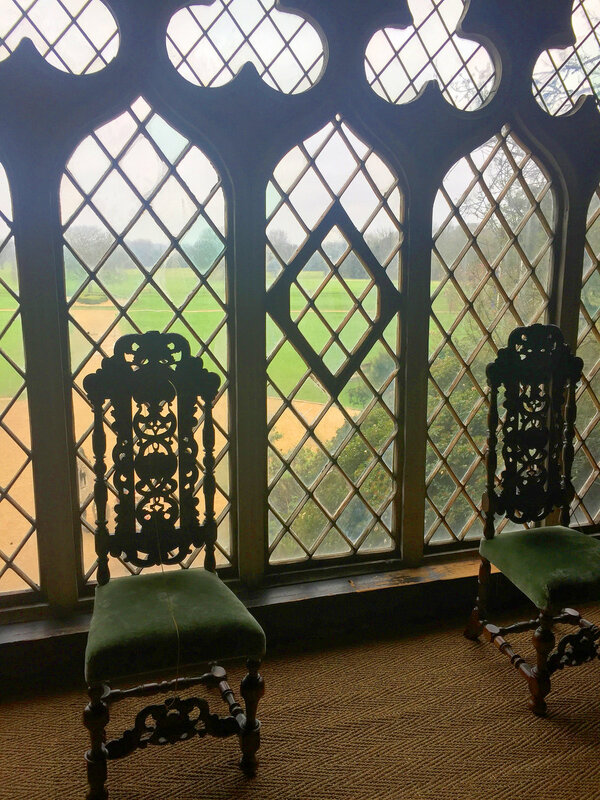 The stunning Tudor windows illuminate similarly carved cabinets and their finely turned legs. The oak armchair in the corner is said to have belonged to Robert the Bruce of Scotland. The castle’s proximity to Dublin means it was well used by government officials over the years, and family members served in several influential positions. The sturdy walls withstood an attack during the Silken Thomas rebellion (1534-35). 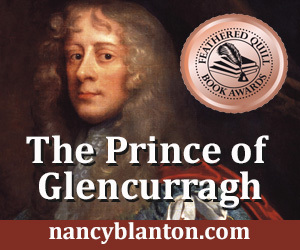 And in 1639, withstood a different kind of attack when the Lord Deputy of Ireland, the Earl of Strafford, Thomas Wentworth (the subject of my third novel, The Earl in Black Armor) tried but failed to acquire a portion of the Talbots’ land holdings. When John Talbot was banished to Connacht for participation in the Irish Rebellion of 1641, the English Parliamentarian Miles Corbett took a seven-year lease on the castle and 400 acres. Corbett was later executed for regicide—having participated in the execution of King Charles I—and after the restoration of King Charles II in 1660 the castle and grounds were restored to the Talbots. Most touching is the story of the 14 Talbot cousins who met for breakfast at the long dining table in the castle’s great hall. It was July 1, 1690, the day of the Battle of the Boyne. The Glorious Revolution was as hand. All 14 rode out at first light to defend their Catholic King James II against William of Orange. But all were assigned to the same cavalry squadron that attacked the Williamite camp. William’s troops defeated the royalists. Only one cousin returned to the castle: young Richard, the heir. Richard the elder then faced charges of treason and fought to secure his family’s inhabitation, if not ownership, of Malahide Castle. But the Talbots were only to have most of their rights stripped away again when Richard the younger inherited the estates, by the penal laws that severely restricted the rights of Irish Catholics. And yet the Talbots endured—as did many of the castle’s inhabitants. So much so, that at least five ghosts are known to haunt the castle. Among them is Sir Walter Hussey from the 15th century who was killed in battle on his wedding day; Lady Maud Plunket who chases her husband through the castle; Puck the jester who fell in love with a lady at the castle and was found stabbed in heart; the White Lady who escapes from her portrait in the Great Hall to wander the castle corridors; and also the executed Miles Corbett, mentioned previously. The Talbot family fortunes improved when Richard’s grandson by the same name made an advantageous marriage. The new family alliance meant that the Marquess of Buckingham, very powerful in King George II’s court, could and would ‘revive the Talbots’ place in society,’ but Richard would first have to renounce his Catholic faith. Richard did so in 1779. Later, broad social reforms of the 19th and 20th centuries required increased taxation of the rich, so that some of the Talbot lands were sold to cover the costs. When the 7th Baron Talbot died in 1973, his sister Rose was forced to sell the Malahide estate to meet what author S.E. Talbot calls the ‘extortionate’ death duties of that time. Shannon Heritage now operates Castle Malahide as a popular tourist attraction. War and Peace: The Survival of the Talbots of Malahide, 1641-1671, Joseph Byrne, Maynooth Studies in Local History, 1997. Into the Lion’s Den: A Biographical History of the Talbots of Malahide, S.E. Talbot, 2012. The Ancient Castles of Ireland, C.L. Adams, 1904.